Long to Medium Hairstyles are the latest trending ideas these days! Want to keep your long tresses, but tired of their longer styling time? This is what women who have long hair sometimes feel. “Long hair is an unpardonable offence which should be punishable by death.” — Morrissey. Long hair is no doubt a symbol of feminism since ages. However, this beauty comes with more responsibility. As long locks need more attention in terms of maintenance and of course more amount of hair care products. No worries, because the length in between long and medium is the best solution in this regard. This length has a feel of long locks while provides styling versatility of medium strands. Moreover, every morning you will have to spend less time in front of the mirror. 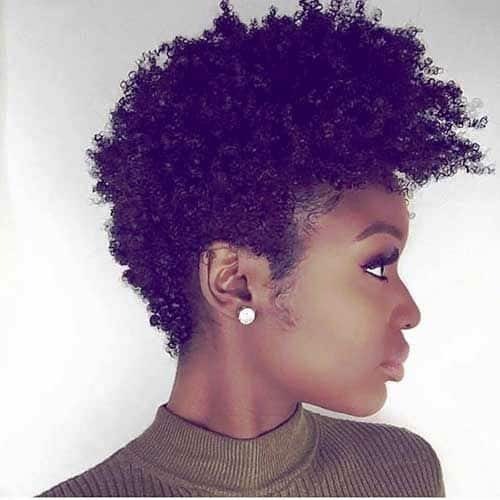 No matter what your hair texture is, these ideas will make your stye look more alluring and captivating! Moreover, all hair types including curly, wavy, sleek can be transformed into an elegant and flattering manner. Hence, have a look at below mentioned 19 amazing Long to Medium Hairstyles and choose the one you love the most! “Her hair was longer than it used to be, and it veiled her shoulders like a shawl. She used it for protection.” — Sarah Addison Allen. So, the long hair is a classic way to wear the style in every era. Moreover, you can opt for the long to medium hairstyles for more comfort and ease. Because, the medium length hair is not too long nor too short and that medium way of expressing your beauty wins the hearts, indeed! This Long to Medium Hairstyle is adorable as it provides a manageable length. Moreover, it gives you enough room to play with hair ends. It reminds of horse’s tresses flying freely in the cool breeze! The hair dresser will chop the tresses at two different lengths shorter from the front and longer from the back. Front layers frame the face, whereas longer layers draw attention towards the bottom. A good blow dry job is necessary to recreate this look in its true sense. This one is a nice option if you love to keep your hair open all the time. 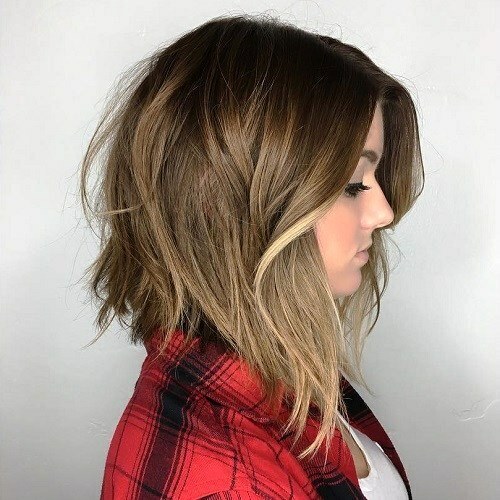 If you are looking for some simple Long to Medium Hairstyles. Then this hairdo is a must try. Thick layers, especially hold this hairdo the best. A curling rod is used to flip the ends with a rough blow dry styling. Light layers at the bottom add movement and interest to the overall look. Hence, this spicy addition of choppy and flicked ends is simple yet super stylish. 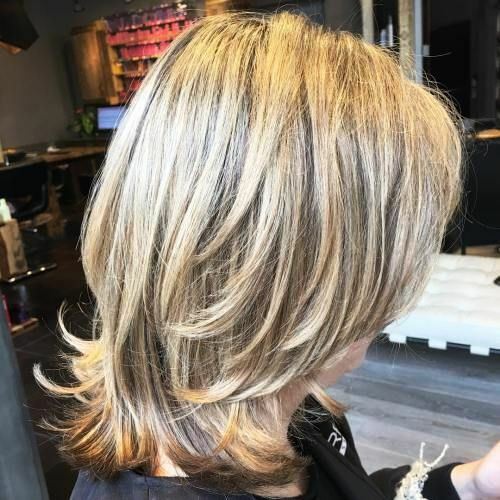 The long lob with blonde highlights is flattering, isn’t it? 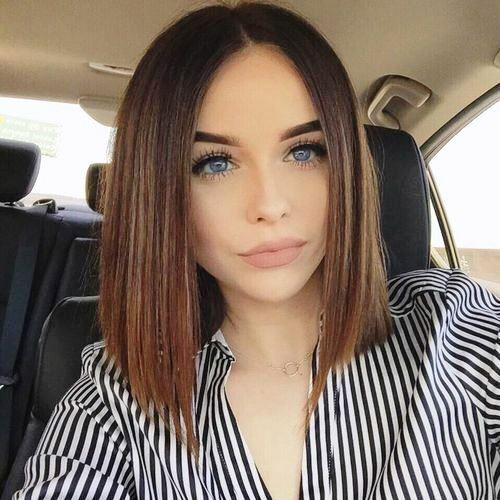 Lob based Long to Medium Hairstyles are hitting the style charts as they look gorgeous on everyone. Furthermore, they are modern as well as versatile. This hairdo particularly looks good on women with naturally wavy hair. All it requires is a single go of a large barrel curling iron to pronounce the wavy texture. And you are all set to jazz up the events! This Long to Medium Hairstyle is perfect for those ladies who want to remove weight from their heavy locks. One can add layers at different lengths which reduces the weight but, still make the strands look heavy. The first layers are incorporated at the middle point and then move downwards in steps. A curling rod and a rounded brush are used to flip the ends. The end result is an adorable and bouncy look with full of movement and volume. Don’t forget to add caramel highlights to make it more flattering. 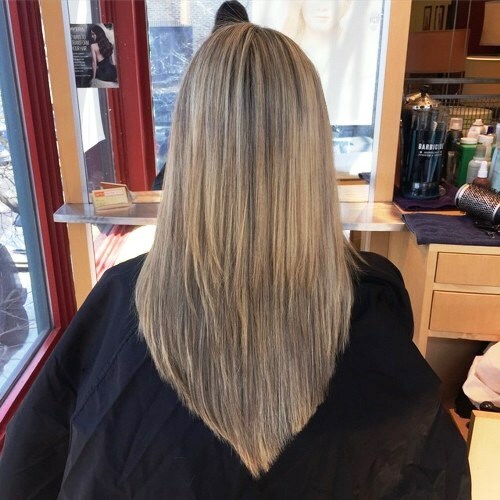 Straight hair may sometimes appear dull and flat. A little spice of curl can add a lot of movement and dimension. Such Long to Medium Hairstyles feature curled layered ends, which give life to otherwise lifeless roots. For a more textured appearance use a curling rod to define the curls and flick the bottoms. Long hair and bangs make a great combination to upgrade the style statement. The colored highlights which complement the skin tone make the bangs more flattering. Keep the front layers shorter to get a face framing effect. Plus, use polished brown shades with undone waves to get an effortless and chic look which will never disappoint you! From the red carpet to club parties, the super sleek hairstyle is so much in trend! Such Long to Medium Hairstyles go well with girls with naturally straight hair. In this way, there will be less use of straightener or flat iron. To add a little twist in overall straight hairdo, ends are razored to make it fall in a more stunning way. Therefore, say goodbye to bad hair days with this gorgeous hairdo requiring less styling time! These days trending haircuts are those which require less effort. This is the reason layered Long to Medium Hairstyles are hitting the style world by the storm as they look pretty even if messy. 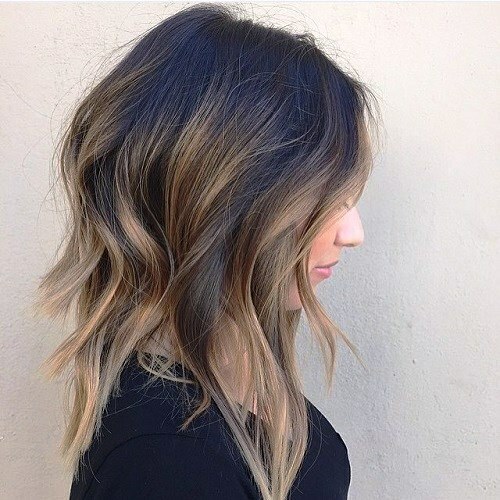 A blend of layered cut with a shag is appealing for girls who want to keep their hair open. The front locks are chopped till eyebrows to give a youthful vibe. To add a fun element keep the strand a bit messy. The end result is a somewhat retro look which is too adorable to handle. There are so many chic layered Long to Medium Hairstyles. However, this one will definitely come under the top 3! 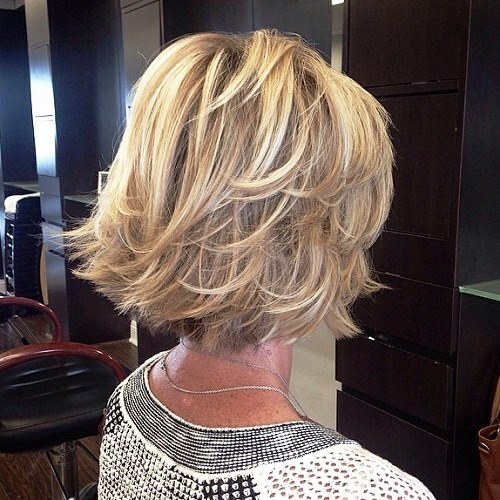 This cut features smooth and relatively long layers with feathered ends going towards the back. A right color selection can make it more flattering. 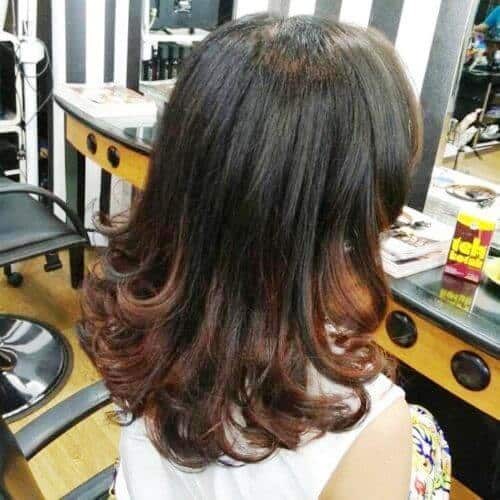 As you can choose a blend of golden brown and red which creates a head turning look in no time! From wedding functions to party events all gatherings can be rocked with this attire. To style fine hair is a bit tricky. However, a right haircut can make fine locks look gorgeous than ever before. This stylish Long to Medium Hairstyle contains face framing front layers and feathered bangs all over the crown. From the roots, locks are kept sleek to make it more appealing. The end result is a flashback 70’s look of disco clubs. So, grab the bell bottom pants to get a unique style statement! The cutting technique is important in this regard. Here in this Long to Medium Hairstyle, heavy layers are imparted in wavy locks. 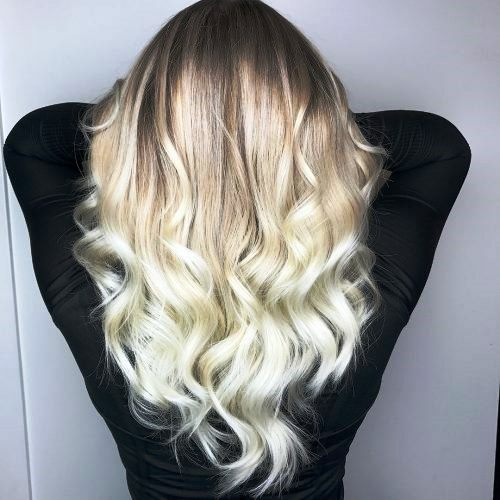 A brown or platinum color dye really complements this cut. Finish the style with a good quality volumizing salt spray to prevent hair from falling flat. Hence, this cut is one of the great options if you are looking for long to Medium Length Hairstyles for Thin Hair. 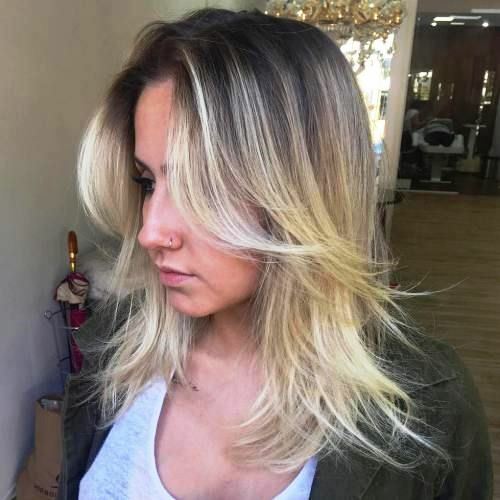 A right color dye is necessary to add more dimension in a regular haircut. 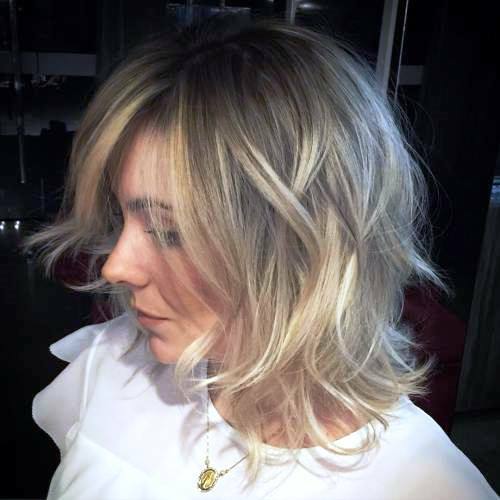 Two tier layers and gently placed highlights are enough to drastically transform your personality. Layers at different length impart a great dimension and movement. Whereas, the caramel highlights prevent the plain or boring look. So indeed, a sleek hairdo is instantly softened by flicking the ends inwards. The soft look along with the chocolate dye of this Long to Medium Hairstyle is exceptionally mesmerizing. Don’t go for very heavy layers if you have fine hair. Keep the layers longer, softer, and less. Gently tie you fine strands up to make them look fabulous without much effort. The recent eyebrow grazed look of Taylor Swift is too eye catching, isn’t it? Layered hairdo is perfect for fine hair. As it imparts style and texture to otherwise flat hair. 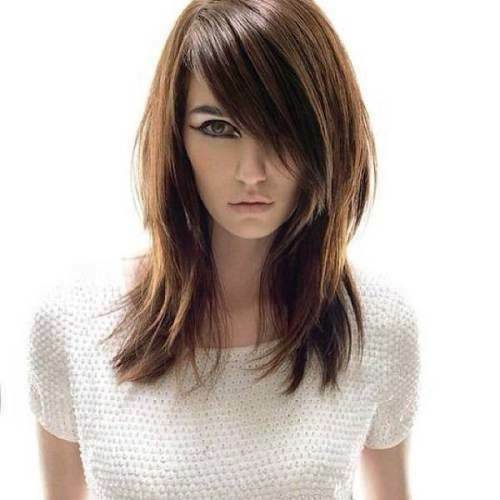 Bangs with layers further enhance the movement factor in this one of the trendiest Long to Medium Hairstyles. Front layers chopped till the eyebrows soften the whole look gorgeously. Finally, the blonde highlights and colored lenses completes your look for any friends gathering! Shaggy layers along with heavy bangs are essential components of this adorable Long to Medium Hairstyle. 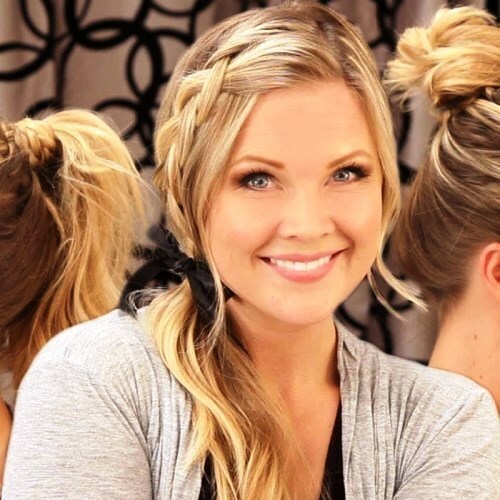 The side bangs create a flirty and flattering look. Whereas, the layers add dimension to the entire look. For ladies with fair complexion and blue eyes, the brown ginger color dye is quite stunning. 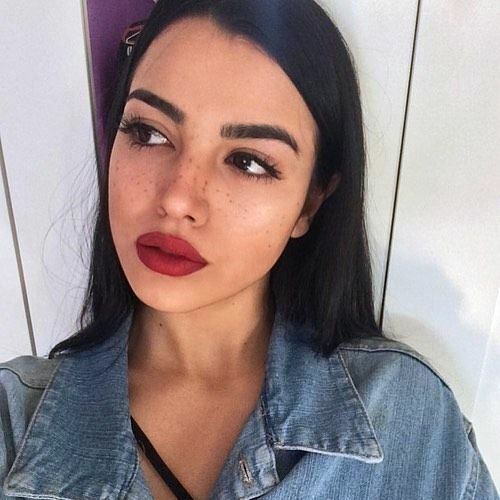 From school going teenagers to party loving girls, all can rock this simple style within no maintenance time. A good quality hair serum is necessary to pose minimal damage to the hair while straightening. One of the major purposes of Long to Medium Hairstyles is to have a manageable length with as much movement as possible. This wispy hairdo serves this purpose beautifully. The eye catching part of this cut is its high crown which is further pronounced by using heavy bangs. Furthermore, teasing on the top gives height which complements the blonde highlights. If you are looking for long to Medium Length Hairstyles with Bangs for round faces then, this cut is a must try this season. For ladies who are not willing to spend plenty of time and money on their tresses can try this mermaid Long to Medium Hairstyle. Ombre hair dye is the one complementing this simple yet chic hairdo. One will have to trim the front bangs on a monthly basis. Whereas you can allow your rest of hair to grow as long as you want. However, keep the length as long as it appears trendy. To add a twist, keep the root color a jet black to make it appear classier than ever before. Hollywood celebrity such as Zooey Deschanel is giving us some major styling goals! A blend of point razored fringe with a long shag is voluminous as well as sassy. Long side bangs is a modern way of getting the face framing effect in a traditional shaggy Long to Medium Hairstyle. Front short layers further soften the entire image in an absolutely stunning way. This haircut goes well for the girls with round face because of the face elongating effect of side bangs. Plus, a color dye such as dark brown or light black further enhances the flattering factor while keeping the look simple. 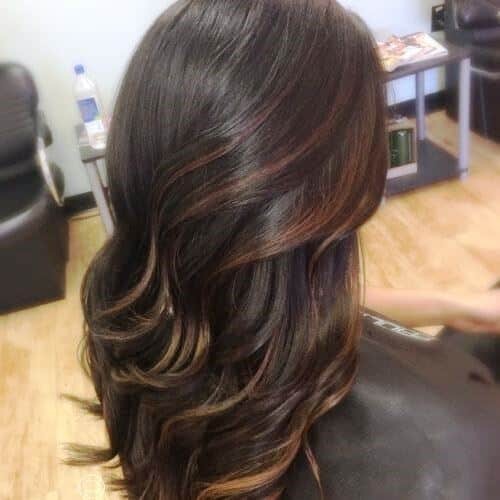 This Long to Medium Hairstyle is creating an OLALA look instantly! For women with thick hair, the peekaboo bangs are made for you! Keep the locks side parted to get an extra pound of flattering appeal. Ask your stylist to keep the bangs length a bit longer to imitate this style exactly. Bobby pins will help you to keep the strands in the right position. Hence, this one is a nice pick for ladies looking for long to Medium Hairstyles for Thick Hair. Thick hair does not have to be boring anymore. The addition of fringe and a soft color dye adds a lot of movement and dimension. A ginger brown or strawberry blonde shade works well in this regard. 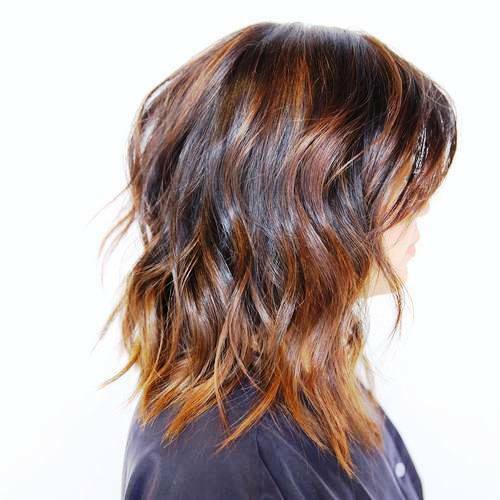 Add light layers along with the soft curls at the bottom to make it more appealing. The end result is a messy Long to Medium Hairstyle which even can work well for finer hair. However, in that case, don’t go for heavy layers. And blow dry hair roots to add an extra lift. The ladies blessed with long hair and looking for the styling diversity… let’s manipulate the hair length. The length in between very long and medium falls right in this regard. It gives the pleasure of long hair while imparts diversity of medium length tresses. There are so many enviable styling options featuring modern cutting tools. These haircuts accommodate all face types such as oval, diamond, and square gorgeously. Such hairdos are less maintenance requiring as compared to Long Haircuts. Hence, it’s time to get inspiration from the above mentioned ever trending and adorable Long to Medium Hairstyles. Check it out and choose the one as per choice, skin tone and personality!